I genuinely LOVE this pie crust recipe. The original version is found in ‘The Joy of Vegan Baking’ , though due to my cabinets needing to be replenished, I had to make a few small adjustments… much to my delight, the dough still came out wonderfully! 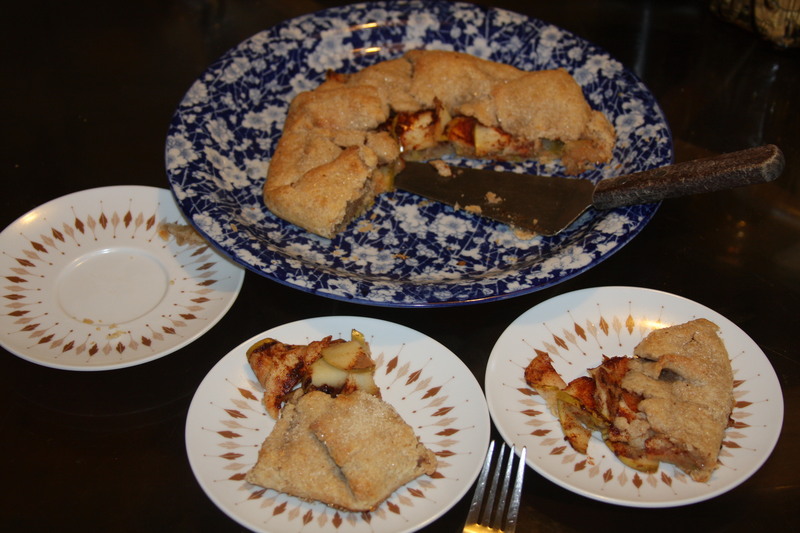 If you are in a fix and feel like you don’t have time to make an entire pie, check out my recipe for a simple yet impressive apple crostata! There are so many things to be done with a good crust around the holidays, I would recommend having some dough in the freezer (or refrigerator) for when the baking mood strikes! This makes enough for two 9″ pie crusts or one covered pie crust (a pie with a top & bottom crust). This dough freezes well or can be refrigerated until ready to be used. TIP: I always put ALL of my ingredients into the freezer for about 30 minutes before making the dough. The easiest way to do this is to measure your dry ingredients in a bowl, put it in freezer. Cut up your shortening and butter into 1/2″ chunks and put in freezer in a small bowl. You want the fat to stay as cold as possible for the flakiest crust! 1) Combine the flour, sugar, and salt in the food processor. Blend about 10 seconds to mix well. 2) Scatter the pre-cut shortening/butter over the dry ingredients and PULSE in little bursts until the fat is broken up into the size of gravel or peas. 3) With the machine turned off, slowly drizzle the ice water over the top. Now pulse several times until no dry patches remain and it begins to clump. Squeeze a bit of dough in your fingers – if it sticks together, it is ready to be gathered up by hand… If not, add a touch more water and pulse again. Do NOT allow the ball to roll into a single mass (such as you would with bread or pizza dough). For a good flaky crust, you want it to hold together but you want it to look chunky, discolored/patchy and rough. You should be able to see little bits of butter or shortening here and there. First lightly sprinkle your working surface with flour. Personally, I like to roll my dough out right on top of the saran wrap it was wrapped in and use a lightly floured rolling-pin. That way it won’t stick, it spins easily and it can be flipped right onto my baking sheet or into my pie plate when I am ready! When rolling out dough, the trick isn’t to “roll”, but to “press” the dough outward from the middle. 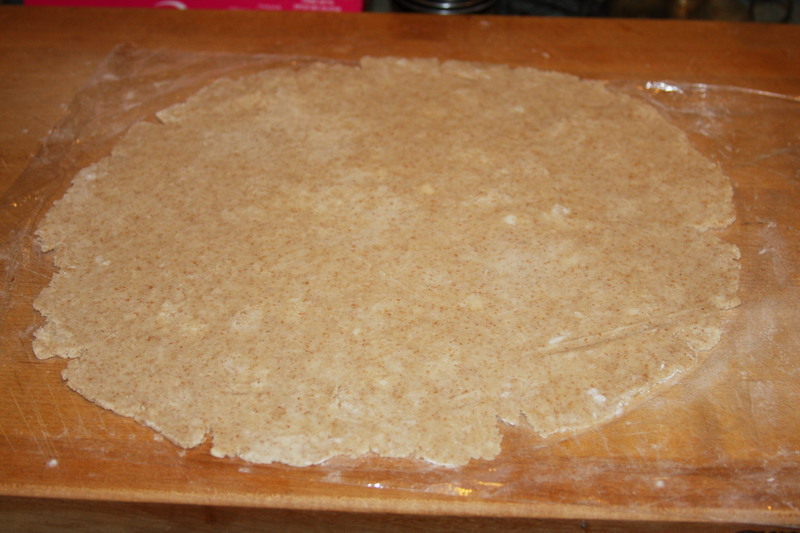 I roll my dough out from the center, turning the dough as I go so I am rolling outward from different directions. 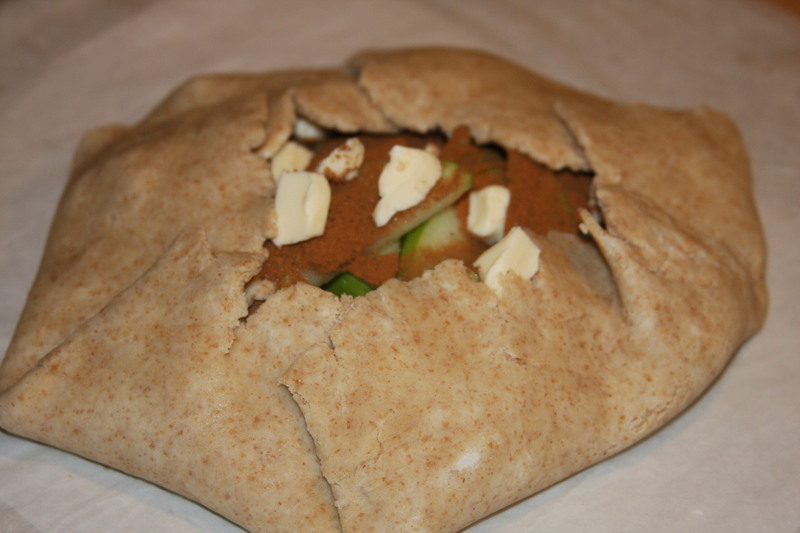 If you get a split in your dough, it may just be too dry… just gently “glue” it back together with a dab of cold water. Roll it out, big and nice – I’d shoot for 2-3″ wider than your pie plate. Most pies are 9″ so I’d say shoot for a circle close to 12″ across. Rolled out & ready to flip into a pie plate… or turned into a delicious crostata! TIP: To relax the dough and avoid shrinkage, chill the crust in your pie tin for 30 minutes before filling and baking. If you are making a crostata, just transfer your dough onto a parchment lined baking sheet and go for it!… Making a crostata is an easy way to look like you’ve been slaving away in the kitchen all day… when in fact… you haven’t! This recipe is great for when you don’t have time to make a pie! I would imagine that you can really use any fruit for this simple dessert… I have used apples and peaches (both were a hit), though I would guess raspberries or blueberries would also work. It appears that a lot of work went into it when you can literally throw it together and get it in the oven in about 15 minutes, start to finish – that is, if you already have pie dough ready! Serves 4 (though it can be cut to serve 6). Eat it for breakfast… or dessert! 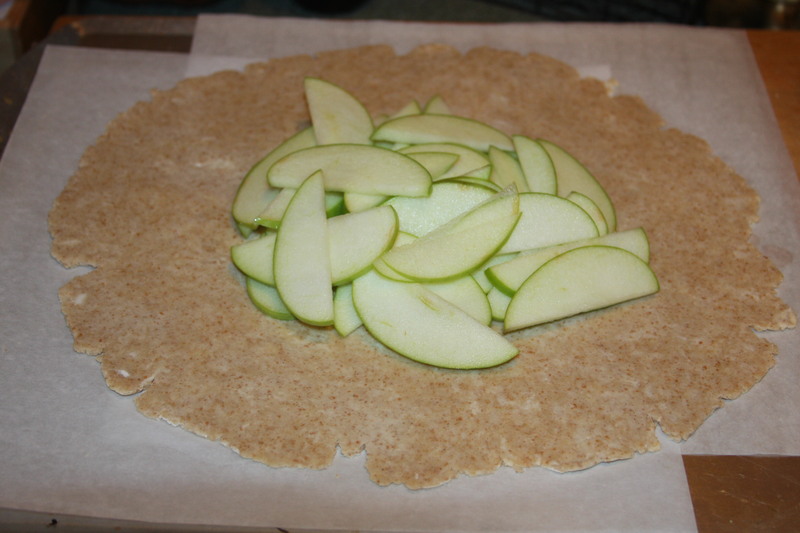 1) Simply cut the apples into thin slices. Put in a bowl and drizzle a tiny bit of lemon juice over them and toss to keep from browning. I’m not really sure how necessary the lemon juice is, since it’s all getting baked in brown cinnamon anyway! But, do as you wish! 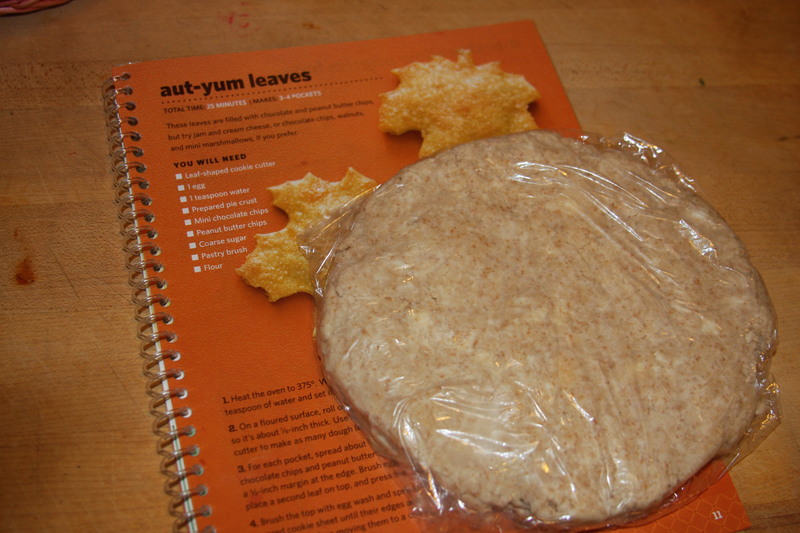 2) Roll out your pie dough and flip it onto a parchment covered baking sheet. 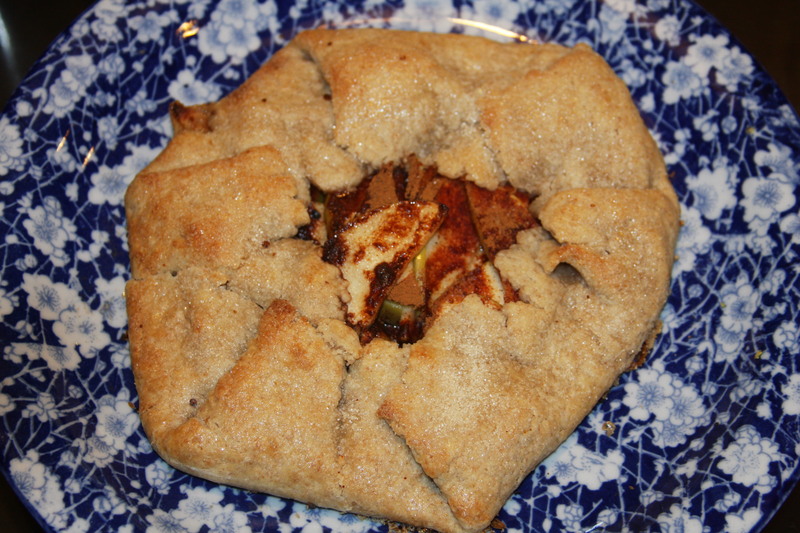 3) Dump apples into center of pie dough. Sprinkle the cinnamon, sugar, and nutmeg over them. Dot all over with butter. Roll out dough, pile on the fruit… believe it or not, this is only ONE apple! 4) Fold up edges gently and carefully around the center, pinching closed slightly if & where necessary. Brush the dough with soy milk and thoroughly sprinkle the remaining 1 Tbsp of sugar over the top. Bake at 425 F for 16-20 minutes or until golden! Let cool 5 minutes before sliding it right off the parchment onto a serving dish. Serve to the “ooh’s” and “ahh’s” of those awaiting! An impressive yet simple dessert! Cut into 4 or 6 slices! Serve with vanilla ice cream, if desired! Eat for breakfast or dessert! 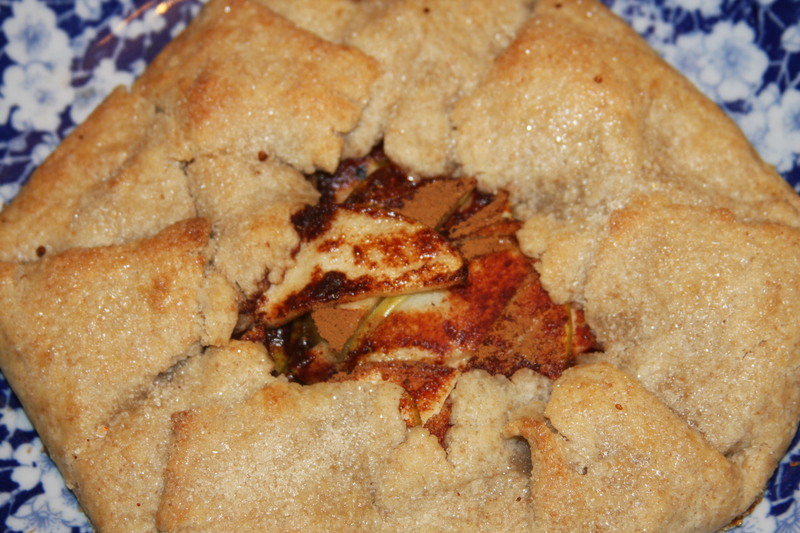 This entry was posted in baking, cakes & cookies, desserts, fall, holidays and tagged apple crostata, baking, cooking, flaky pie crust, healthy cooking, joy of vegan baking, things to do with pie crust, Vegan, vegan crostata, vegan flaky pie crust, vegan pie, vegan pie crust, vegetarian. Bookmark the permalink.